Well, there are many varieties of Thai food and beverages available during the food festival, from snacks, noodles, instant noodles, rice, sauces, cooking ingredients, beverages and many more. Not only that, there are lots of sampling, promotions, games and etc going on for three days. 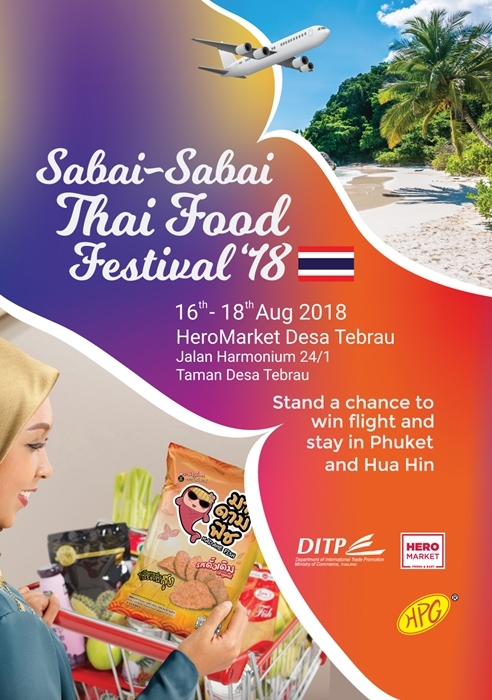 Be sure to head over to HeroMarket Desa Tebrau, Johor Bahru for Sabai Sabai Thai Food Festival 2018 and stock-up your Thai food, snacks, beverages and enjoy Thai cultural performances. If you spend more RM50 at Hero Market Desa Tebrau you will receive a free 15-minute Thai massage courtesy of Thai Odyssey. During ‘Sabai Sabai Thai Food Festival 2018’ for every RM5 purchase of Thai products at the Hero Market outlets from 3rd to 31st of August 2018, you are eligible to participate in a lucky draw to win exciting prizes. Wow! I bought some products at the festival and have submitted my forms already. All the best ya! The first prize winner will receive two return flight tickets to Phuket with accommodation for a 4-Day-3Night stay while the second prize winner stands a chance to win two return flight tickets to Hua Hin, with accommodation for a 3-Day-2Night stay. The third prize winner will receive a hamper worth RM500, fourth prize: a hamper worth RM300 and fifth prize: a hamper worth RM200.